Taking images of the diamond ring, Baley's beads and the spectacular eclipsed Sun is of course what we all want to do! I wrote a post discussing taking images of the horizon, which I think everyone should try to get an image of this. Remember NO FLASH! But the other cool thing to do is frame totality with another planet in the sky, if that particular eclipse will have one bright enough to image. 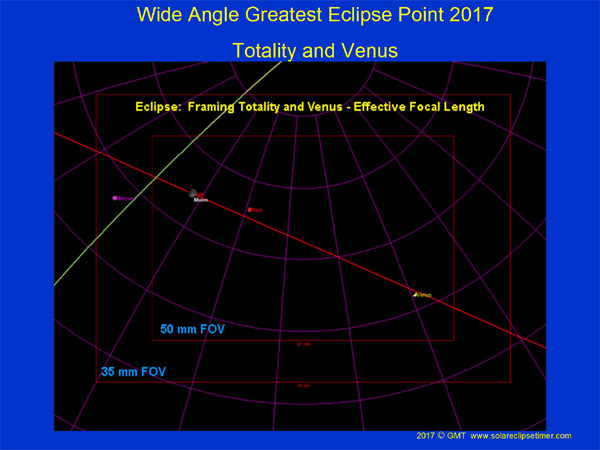 Our 2017 eclipse has the opportunity for us to image Venus during totality. The good thing is Venus will be very bright to the West of totality, so it's is going to be a beautiful site. At mag -3.97 it is going to be spectacular, I can't wait to see it. The bad thing is that is will be 34 degrees to the West. This will require a short lens to frame it WITH totality and will make the Sun disk image small. It seems like we will need a camera with around a 50mm lens. This is also going to require that the photographer understand their camera, their crop factor and their effective field of view. The other thing about capturing an image of a planet with totality is that the planet is usually dim, so to expose enough to see the planet, you need a longer shutter speed and then totality gets over exposed. But that's just what you have to do. We are going to be much better off with Venus at mag -3.97 regarding a better exposed totality, but the image scale is going to be small. 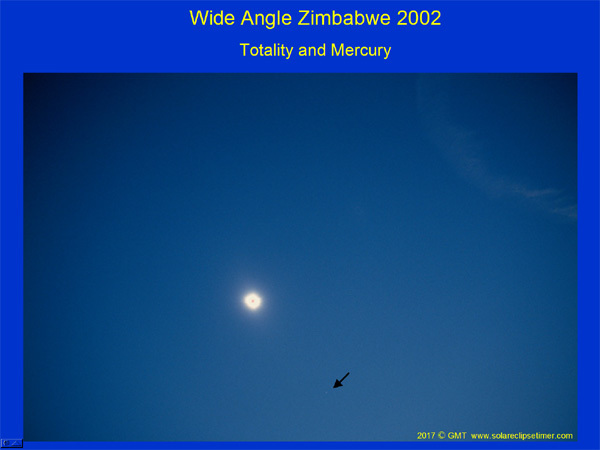 I have attached slides from my talk that demonstrate framing a planet with totality along with a screenshots from The Sky Astronomy Program so you can better understand the relationships. 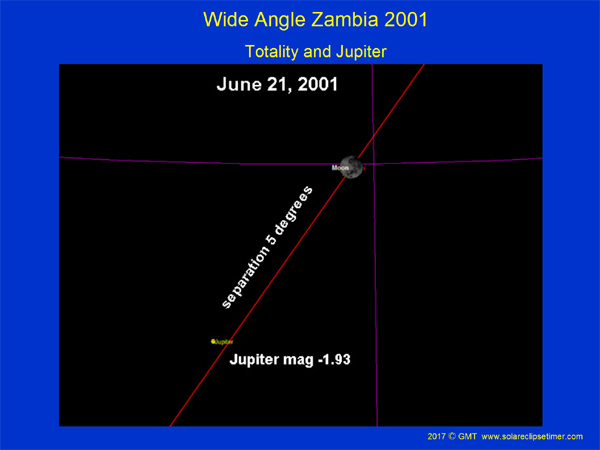 The Jupiter image in 2001 was easy to get in terms of framing because Jupiter was close to totality at 5 degrees away. I was shooting that eclipse with a 50-500mm zoom lens and a 2x teleconverter on a camera tripod. So during totality I was at 1000mm. But for this planet image it was nice to have the flexibility to just zoom out to 200mm, re-frame the shot and bracket some shutter speeds. So for this particular eclipse and this image, the flexibility of the zoom lens and an un-guided tripod worked to my advantage. 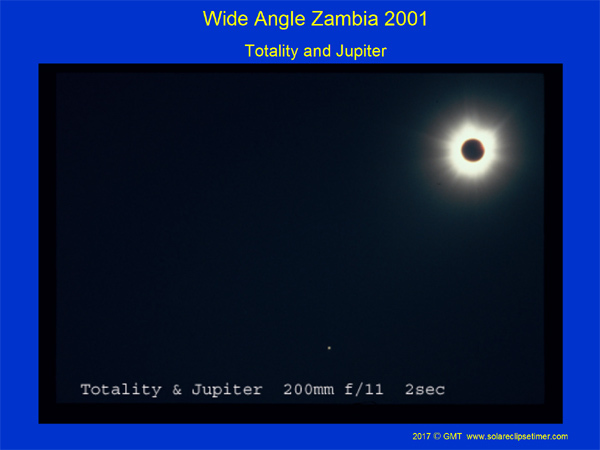 To expose long enough to see Jupiter (mag -1.93) required a 2 second shutter speed, so you see that totality is a little over exposed. In 2017 Venus will be much brighter, but you won't be able to use one zoom lens for your eclipse shots and your shot including Venus because it will be too far to the West. The Mercury image in 2001 was taken with a separate camera, setup on a separate tripod just to frame for this shot. It was not taken by zooming out with my primary setup, which in 2002, my primary setup was on a clock drive. I don't have an exact record for this shot, but I believe it was taken with a zoom lens at between 50 and 100mm, around f4 and I don't have the shutter speed because it was part of an auto-bracket program. You can see that Mercury, which was mag -0.64 is barely visible. I know that the shutter speed was long because totality is over expose and the sky background is really light. Mercury was 11 degrees from totality in this image, so you can use this as a reference for Venus in 2017, it will be 3 times further away from totality, but to the West. Venus at mag -3.97 will be much better to get a bracketed exposure that shows the planet, but also exposes totality more reasonably. For 2017 I have attached a screenshot showing Venus. 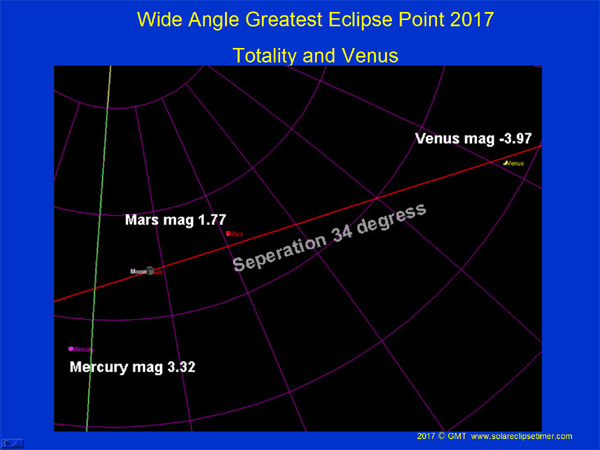 This screen shot shows the positions of Mercury, Mars and Venus at totality, in the sky, at the point of Greatest Eclipse in Kentucky. 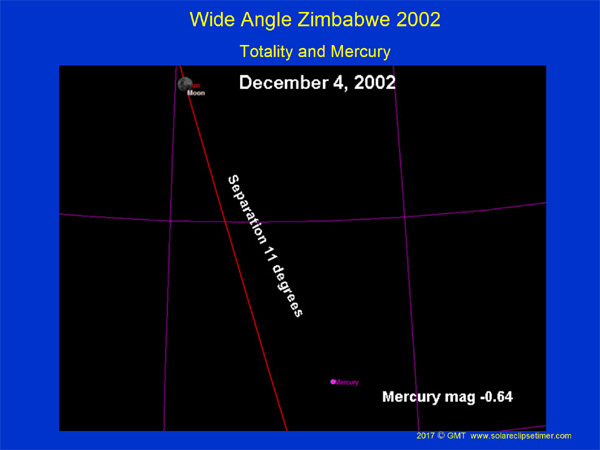 From my experience imaging Mercury in 2002 at a mag of -0.64, it is doubtful that we can get Mars at mag 1.77 and will not be able to get Mercury at mag 3.32.